‘I never set out to be the only woman blah-blah,’ insists Paula Scher, the first woman to be made a partner at Pentagram; ‘I set out to be a designer.’ Yet in 2013 no one can deny that standard accounts of graphic design are still more populated by male designers than by the women mentioned in this handsome and ambitious volume, evolved out of a research project conducted by the editors, Gerda Breuer and Julia Meer, at the Bergische Universität Wuppertal in Germany. 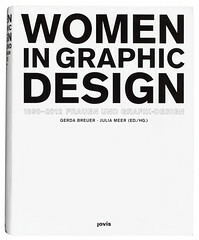 The 600 pages of Women in Graphic Design: 1890–2012 are rich in visual material. Modest but amply sized colour reproductions spanning the period in question are interspersed through the essays, interviews, documents and short biographies of which the book is composed. But unless you are bilingual in German and English (which I am not), you will be excluded from reading 50 per cent of the text. This is unfortunate, because the English abstracts of the German essays promise a more expansive yet nuanced view of the subject than many English-speaking readers will be familiar with. These are arranged so as to maintain a sense of context and to keep the overriding question of how actually to represent work by women to the fore. So Breuer’s essay on the marginalisation of women in the organisation and rhetoric of avant-garde Modernism is followed by Ada Raev’s exploration of the Russian exception to this rule. There are also essays on individuals such as the Dresden-based poster designer Dore Mönkemeyer-Corty; Beyer Verlag’s Bauhaus-trained art director, Irmgard Sörensen-Popitz; the calligrapher Anna Simons; and on Ray Eames’ contribution to the office for which her husband is more commonly noted. From her interviews with graphic designers in the former East Germany, Judith Siegmund suggests that issues of gender inequality are not perceived as relevant, or are subsumed, when living in an authoritarian state. She may have a point, because what there is in English in the book reinforces American dominance of writing on female graphic designers. Ellen Lupton lends authority and gloss through her survey of the US scene, in an extended version of an essay published in 2000. 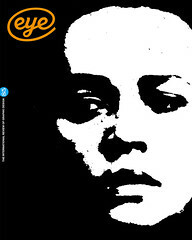 The presence of usual suspects – Cipe Pineles, Muriel Cooper, Lorraine Wild, Zuzana Licko – does not mean that Women in Graphic Design 1890-2012 is not valuable or timely for English readers. The editors’ introduction, which has been printed in full in both languages, acknowledges from the outset that many young women in 2013 do not identify with the dogma of feminism’s past. It also asks how the profession should be assessed within the context of the new neoliberal politics,‘which can be readily correlated with the occupational situation of women’. Indeed, much feminist literature of the 1960s and 1970s argued for the value of affective and emotional labour, values that have since been integrated into arguments for ‘creative economies’ in contemporary times. In this vein, the excavation and rehabilitation of seminal texts in the ‘Documents’ section of Women in Graphic Design is important. Many of the texts date from the mid-1990s, when the emergence of digital technology coincided with the burgeoning of the relatively new field of design writing. If Scher is a mouthpiece for those who feel an emphasis on gender detracts from the quality of their work – she is represented in this section by the public letter she wrote in 1993 drawing on the metaphor of ‘the boat’ – she has a counterpoint in Sheila Levrant de Bretteville, the founder of the Women’s Graphic Center in Los Angeles, who later became the head of the Yale graduate school of graphic design. Reading de Bretteville’s 1973 essay ‘Some Aspects of Design from the Perspective of a Woman Designer’, one is reminded that ambiguity, complexity, fragmentation, multiple perspectives and user-participation were once conceived as explicitly ‘feminine’ strategies. Visibility is a crucial issue throughout this book. Time and again its subjects insist they lack the time or inclination to big-note themselves in traditionally egocentric ways and forums – on the lecture and awards circuit or in monographs. You may or may not agree with Véronique Vienne’s assertion that this tendency can be traced to women’s biological ability to house gestation before the act of creation. The implication, however, is that women embody different values, not predicated on display, and exert their influence in more indirect and diffuse ways. One of the few recently written ‘documents’, a 2011 essay by Alissa Walker, traces a lineage of women’s contribution to experimental education and the emergence of graduate design. Women such as de Bretteville, Katherine McCoy, Anne Burdick and Lisa Grocott have been pivotal in encouraging the overlapping of subjectivity, social consciousness and a more holistic sense of wellbeing with an ethos of design. The last 200 pages of the book contain nearly 400 short biographies. Readers are unlikely to read these from beginning to end, and a single entry will give you a very compressed understanding of any one woman’s contribution. But in their sheer number they are a reminder that the alternative to conventional forms of visibility is not disappearance. Without being didactic, this book is both a foundation and an invocation for more work, for new narratives to be written and for new forms of visibility to be found. If women continued to do this then maybe Paula Scher could step back and get on with her work. With greatest respect to her, she has earned that right. 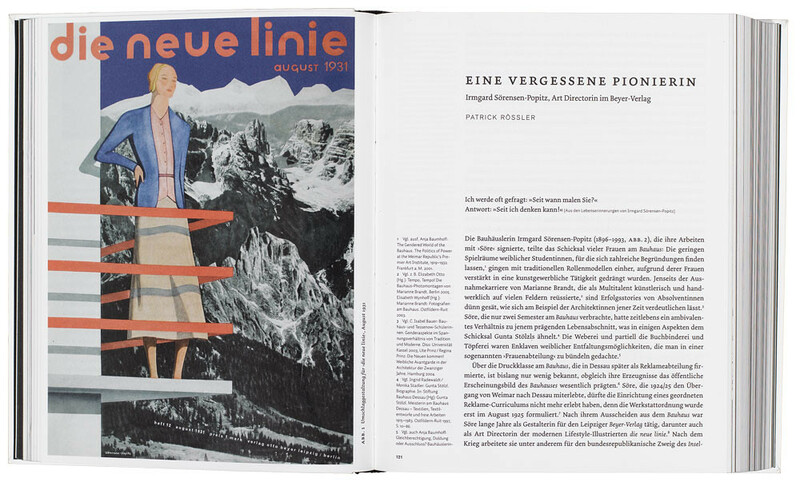 Top: spread featuring Irmgard Sörensen-Popitz’s cover for German lifestyle magazine Die Neue Linie, August 1931.